11. Mascagni: Cavalleria rusticana. Bada, Santuzza! 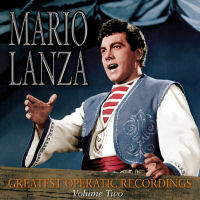 When "Mario Lanza: Greatest Operatic Recordings" (SEPIA 1274) was released in February 2015, Lanza fans were delighted, for this compilation disc was said "to do justice to his much misrepresented recording legacy". Now, in response to requests from around the world, we gather some more Lanza operatic recordings; some never before released commercially ("Qual occhio al mondo"), some private ("Aria sconosciuta" and "Questa bocca tua"), some live ("Lasciatemi morire" and "Gia il sole dal Gange") and some radio broadcasts ("Vesti la giubba") etc. to form a Volume 2 compilation, lovingly presented in re-mastered sound including Lanza rehearsing and warming up his voice.